If you’re looking for a great team building or networking opportunity, or a way to say “thank you” to clients, we recommend golf! The Cove Cay Golf Club can customize events of any size and can provide a fun, non-threatening environment for golf newbies and advanced players alike to either learn the game of golf or hone their golf skills. Whether you’re interested in a 2-hour short game clinic for 12 people that includes breakfast or lunch, or a half-day of short game and driver instruction for 50 followed by a dinner, we promise a memorable experience for all. 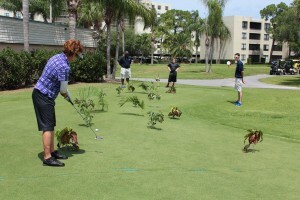 We can also arrange an inter-office golf tournament followed by a lunch or dinner. Our pros deliver an excellent experience, no matter the event, and our restaurant staff will prepare and serve a wonderful meal when requested. All corporate events are customized to each specific client’s wants and needs. Contact Pat Shriver for more information.